Aquarium visitors are being invited to get snappy with one of the attractions. Sparky, a porcupine pufferfish at Tynemouth’s Blue Reef Aquarium, has taken to following visitors around his display. Blue Reef aquarist Anni Tallentire with Sparky the pufferfish. 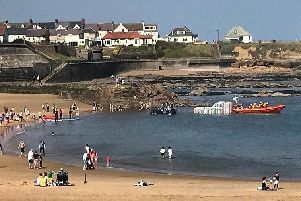 Initially it was just staff, wearing uniform, he began swimming alongside, however now he makes a beeline for any passer by and as a result has started featuring in a lot of visitors’ photographs. He’s now become such an attention-seeker, aquarists have put up a special sign close to his favourite spot in the aquarium inviting people to take their own selfies with him and then send them to them via Twitter. Blue Reef’s Rosie Wiggin said: “We have got a sign up on the display asking people to send their selfies to us @BlueReefT using the hashtag #selfieswithsparkyBRT. “Puffer fish have great personalities and are always quite inquisitive fish by their nature but Sparky seems to be particularly curious. “They are quite intelligent fish and we think Sparky began associating the staff uniform with being fed. “Over recent months he has begun to get really interested in everyone who comes close; regardless of whether they work here or not! Pufferfish are able to inflate their bodies by using special muscles and valves to rapidly gulp in and retain water. They have no ribs so they can inflate up to three times their original size. As well as the ability to inflate themselves most puffer fish are also highly poisonous and there have been a number of reported fatalities among diners in Japan where pufferfish - known as fugu - is considered a delicacy.